Patient was really unhappy with the appearance of her teeth as they looked small, dark and gappy. She really wanted a much fuller, brighter but still natural-looking smile. 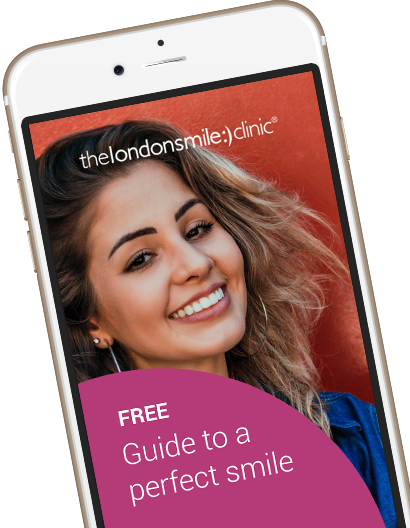 Following her sister’s treatment at The London Smile Clinic this patient was so impressed with the result she chose to have a smile makeover herself. A gum lift on six upper teeth followed by ten upper porcelain crowns and ten lower veneers have now created a natural smile which has exceeded her already high expectations. Dr Russell has done lots of work on my sister’s teeth and it was very impressive. I was not happy with my teeth and after seeing my sister’s new smile I wanted to fix my teeth too. Ten veneers and a gum lift. Yes. When you watch movies the time goes so fast and you forget you are actually at the dentist. It has exceeded my expectations and there were high already because of my sister’s result. It has made a huge difference; I can now smile with the confidence that my teeth look great. They are very professional but at the same time friendly, a brilliant team!